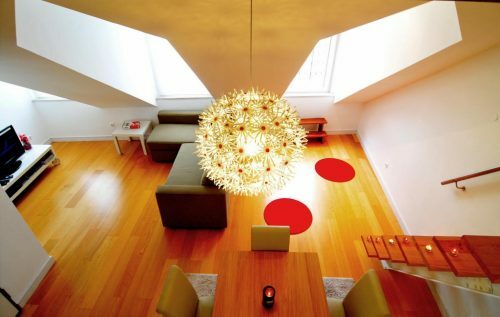 This modern Lisbon apartment is on the fourth floor (no elevator) of a building in Graça neighbourhood. Stylish décor and a spacious atmosphere is what you will find. The apartment has two nice balconies in a privileged situation with an impressive view of Lisbon. The apartment is very close to the square where Lisbon’s most famous market – Feira da Ladra – is held in the early afternoon every Tuesday and Saturday. Behind the various bric-a-bracs, you can also uncover second-hand clothes, books, disks, and, if you dig deep enough, some genuinely valuable antiques. You can easily reach the city centre by foot (about 20 minutes) or by taking the famous tram number 28 (10 minutes), a scenic route crossing most of the touristy neighbourhoods of the city centre. A definite must for any visitor to Lisbon! You can also walk to Alfama (5 minutes) and, from there to the St.Georges Castle (S. Jorge). Chiado and Bairro Alto are also very central areas for your accommodation in Lisbon. Our Apartment in Lisbon 206 is located on the 2nd floor (without elevator!) of an old and renovated historic building in the Baixa district. 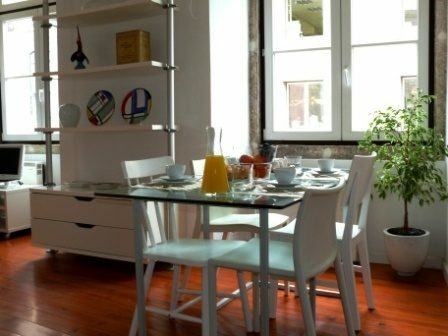 This charming apartment has two large windows in the living room with the old architecture of Lisbon’s building. This stylish and nicely furnished one bedroom apartment offers a lot of natural light, comfort and quietness. It is also on a perfect location to get around as it is in the heart of the historical centre. The building is located on a street full of shops and it is also next door to all kinds of traditional commerce and to a wide variety of restaurants. It is also a short walking distance from the picturesque neighbourhoods of Chiado and Bairro Alto.